Super Small Alarm Grid Stickers Coming Soon! UPDATE: Arrived! Hi DIYers! We have some fun news for you today. Alarm Grid will soon begin offering tiny and cute Alarm Grid Stickers. These are great for putting on your refrigerator, on your laptop or computer or just placing around the house. You will love the upcoming Alarm Grid Little Stickers! As you may know, Alarm Grid already offers window stickers for indoor use and weatherproof outdoor stickers. Our swag lineup also includes the Famous Alarm Grid Yard Signs. These are great for showing the world that your home or business is monitored with Alarm Grid. But we received word from many customers that they wanted something smaller and easier to put everywhere. That is why we decided to offer little stickers as well. Each mini sticker has a strong adhesive backside or frontside that should last indefinitely when properly applied. These stickers are high-quality enough to survive the elements when used outside. This makes them perfect for placing on mailboxes, windows, vehicles and more. We will offer our stickers in packs of one (1), five (5) and ten (10). Each sticker is in the shape of an octagon - that's eight (8) sides - and features the Famous Alarm Grid Blue. You also get our logo, phone number and website for quick reference. The message "Protected By Alarm Grid" is synonymous with top-quality alarm monitoring service. Any intruder who sees this sticker will know not to mess with your home or business! Now you're probably wondering when you can get your hands on these adorable stickers. We're sure that you want to share them with your friends, family and colleagues. We understand. Unfortunately, you have to wait. But we promise the stickers will be available soon, and we will very quickly let you know when you can buy them. For now, the best thing you can do is email support@alarmgrid.com. Let our alarm system support technicians and security planners know that you want your Alarm Grid Little Stickers. We are rushing to get them up as soon as possible, but it doesn't hurt to remind us of the sheer urgency in making these stickers available to you, the Alarm Grid Nation. We promise that these stickers will be worth the wait! Hi DIYers! Today, we'd like to cover some of our newest products from 2GIG. These are all fairly unique 2GIG 345 MHz Sensors that can be used with 2GIG GC2, 2GIG GC3 and Honeywell Lyric Alarm Systems. We are sure that many users will take full advantage of these versatile new products! We actually very briefly touched on these new sensors during our 2GIG ISC West 2019 Post, but we never had the opportunity to discuss them in-depth. These sensors will also work with the upcoming 2GIG GC2e and 2GIG GC3e Systems that should be arriving later this summer. Remember, these upcoming panels will support a lineup of encrypted sensors from 2GIG, as well as the current 2GIG 345 MHz Sensors and Honeywell 5800 Series Sensors. 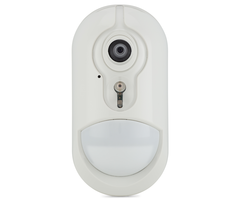 2GIG DW30-345 Outdoor Wireless Door Sensor: This a wireless outdoor contact sensor, much like the existing Honeywell 5816OD. The weather-resistant sensor can have an extended gap of two (2) inches between its magnet. However, it should ideally be less than an inch if possible for best results. It receives power using two (2) AA batteries, which can easily be swapped out when low. The 2GIG DW30-345 is great for outside doors, fences and gates that may be exposed to rain, wind, snow and excessive dust. It can be mounted on a flat or curved surface to meet the needs of the user. 2GIG STVGRL1-345 Stove & Grill Guard: This is a unique sensor that alerts an alarm system when a stove or grill has a burner that is left on. The sensor will remain in a fault condition whenever the burner control is left 20 degrees or more from the usual position. A user can set the associated wireless zone to display a trouble condition whenever the sensor left faulted. This way, they will know to turn the stove or grill off if they accidentally leave it on. It is also great for parents who are worried that their children may be playing with the burner. The device is small and discreet, and it is suitable for indoor and outdoor use. 2GIG F1-345 Safety Pendant With Fall Detection: This is a medical alert sensor that can detect the abrupt and sudden movement that occurs when a person falls down. Just like a conventional medical alert sensor, the user can press and hold a button if they experience a medical emergency or crisis. But the built-in fall detection is great for situations in which the user might be rendered unconscious and unable to press the button themselves. The device comes with a lanyard so that it can be easily worn, and it it is water-resistant with an IPx7 rating. The end user will have no problem using the F1-345 in the bath or shower if necessary. 2GIG GNGRD1-345 Gun Trigger Lock: This a helpful safety device that prevents a user from shooting a gun or firearm unless a 3-digit code is entered first. The sensor will also send an alert to the security system in the event that the weapon is moved or tampered with. This sensor is perfect for families of gun-owners who want to make sure that their children don't get into their weapons or firearms. It is strongly recommended for any gun-owner who wants to ensure that only they can access their weapon. The device is small, discreet and easily to apply. It is powered using a single CR2032 coin cell battery. All of these sensors are available on the Alarm Grid website now! If you would like to learn more about any of these sensors, we recommend sending an email to support@alarmgrid.com. One of our security system experts will see your email and respond back as soon as possible. We look forward to hearing from you and helping you design the perfect alarm system for your needs! Check Out Our Alarm Grid Security System Kits! If you're looking to obtain alarm monitoring service for your home, then you can't go wrong with one of our home security system kits. Each kit has everything you need to get started. One of our highly-trained technicians will call you to active your system, and your home will be protected! With an Alarm Grid Security System Kit, you can expect several essential components. You will receive a wireless alarm control panel that serves as the central hub for your system. This is where you can arm and disarm your system and make programming changes. You will also be able to access your system from an interactive service platform like Total Connect 2.0 or Alarm.com. This is great if you need to control your system while you are away or if you just want to make sure you remembered to arm your system before you left! 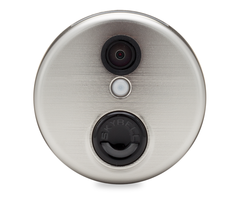 Each kit also includes door and window sensors and a motion detecting sensor. The door and window sensors will alert your security system if a door is opened, while the motion sensor will respond to a person moving throughout the area. We offer kits with varying numbers of sensors so that you can choose a kit that is the perfect size for your home or apartment! We also sell individual sensors if needed. You can start with a small security system now and then expand upon it later. Do whatever works for your home! Users can also expect a Honeywell LT-Cable with each kit. This cable makes it super easy to provide power to your system with the included transformer. You won't need to strip or prepare any wires. The cable comes completely ready. You will just need a screwdriver to attach it. We also recommend choosing a kit that comes with a cellular communicator. This will serve as a reliable backup in case there is ever an internet outage in your home. If the internet goes down, your system will automatically switch to its cellular backup. Not all our kits include a cellular communicator, but we strongly recommend getting one! Also, don't feel intimidated if you have never installed a security system before! Some other companies may not want you to believe it, but installing your own system is super easy! In fact, most wireless alarm systems can be set up using nothing more than a screwdriver. Wireless sensors can be mounted with double-sided foam tape, and wireless panel menus are easy to navigate. And our technicians will be there to help you every step of the way with online and phone support. Remember, you get free support as an Alarm Grid monitored customer. Before you know it, your brand-new system will be up and running! Alarm Grid is your home for all your security system kits! If you need help choosing a system, please reach out to us! You may email support@alarmgrid.com or call (888) 818-7728 during our business hours of 9am to 8pm EST M-F. Just tell us about your home and what kind of monitoring service you want. Our planners will help you determine the best security system for your house or apartment. We are always happy to help, and we look forward to hearing from you! Hi DIYers! Today, we're taking a look at our best wireless recessed door contacts. These devices are great for when you want sensors that are completely hidden and not visible when the door is closed. They take a little bit of extra effort to install, but it's worth it for many users! When you have a recessed contact, you actually need to drill holes into the door and its frame. The hole in the frame is larger and sized to support the main sensor. The hole in the door is smaller and designed to support the magnet. Some recessed contacts use extremely small magnets that can be mounted without drilling holes. There is also the Honeywell 5800RPS, which uses a plunger switch rather than a magnet. 319.5 MHz 3/4" Diameter, 2.25" Deep 3/4" Diameter, 5/8" Deep Qolsys S-Line Sensor. Compatible with all Interlogix/GE Systems, legacy Qolsys Systems and 319.5 MHz IQ2+. Encrypted when paired with Qolsys IQ2 or IQ2+. 433 MHz 11/16" Diameter, 3" Deep 3/4" Diameter, 5/8" Deep Legacy DSC Sensor. Compatible with all DSC Systems and 433 MHz IQ2+. Screw mount and press fit installation options available. 915 MHz 0.75" Diameter, 2.66" Deep None needed! PowerG Sensor. Uses a 2 mm magnet that requires no hole. Uses 128-bit AES encryption. Compatible with DSC PowerSeries Neo Panels, DSC Iotega, every IQ2+. If you're monitored with Alarm Grid, or if you're interested in monitoring, our team would be happy to help you find the best wireless recessed contact for your needs. The best way to reach us is to email support@alarmgrid.com. You may also call us at (888) 818-7728 from 9am to 8pm EST M-F. We look forward to helping you find the perfect security equipment to protect your home or business! Hi DIYers! We have spooky good news for everyone today. We are proud to announce the unveiling of the brand-new Alarm Grid SiXTH Sensor. This is the world's first ever security system sensor that activates upon detecting any paranormal or spiritual activity. It is a must-have for all users! As you may know, there are the five "standard" senses that we use on a daily basis. These are of course sight, smell, taste, hearing and touch. But what you might not know is that there is paranormal activity lurking among us. You cannot detect such occurrences through normal means. You need a "sixth" sense to detect any paranormal, spiritual or otherworldly activity that may be cursing you and the people in your presence. That is why we created the all-new SiXTH Sensor. We took inspiration from Honeywell's SiX Sensor Lineup in creating the Alarm Grid SiXTH Sensor. Just like the existing SiX Sensors, the SiXTH Sensor offers 128-bit AES encryption to thwart any real-life hacking attempts. We also added Advanced Spirit Stopping encryption to stop any hacking attempts initiated from the otherworld. You can count on the SiXTH Sensor to function perfectly both in our present world and the dimensions beyond our normal reach. Please be aware that you can only see the Advanced Spirit Stopping encryption through the use of various psychonautic substances that are neither sold nor endorsed by Alarm Grid. But trust us - it's there! Now, you might be wondering how exactly the SiXTH Sensor works. Well we are happy to explain! The sensor pairs with a wireless zone on your alarm panel much like any "present world" sensor. But you will notice a few things new. You will set the Device Type as "Paranormal Detector". The Response Type should be set to "Bruce Willis". This is a brand-new Response Type designed exclusively for use with our SiXTH Sensor. You will only get this option upon setting the Device Type, so make sure to set the options accordingly. After you save your changes, your SiXTH Sensor will be ready to go! If your SiXTH Sensor detects any paranormal or spiritual activity that should not be present in our present world, a silent spiritual alarm will be sent to your system. Within moments, the central station will get to work sending out a response. But you can't stop spirits, ghouls and curses with police officers, firefighters or emergency medical personnel. Oh no, you need something better. Instead, you can expect Bruce Willis (not that Bruce Willis) to show up at your home or business to rid the area of any paranormal activity. Bruce Willis (not that Bruce Willis) will come equipped with sage and various incantations to cleanse the premises and protect the spirituality of yourself and those around you. While Bruce Willis (not that Bruce Willis) might appear to be in an uncomfortable or unusual state as he performs the necessary exorcism, we can assure you that this is perfectly normal. Additionally, you can expect a call from the central station to make sure that Bruce Willis (not that Bruce Willis) arrived safely and without real-life incident. Please note that Bruce Willis (not that Bruce Willis) does not come with cab fare, and you may be responsible for ensuring his departure. Alarm Grid cannot assist with this issue, and it is up to you to make the appropriate arrangements. 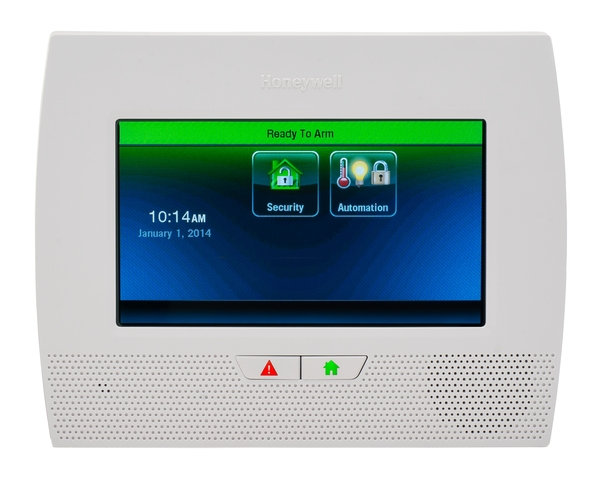 Alarm Grid has already tested the SiXTH Sensor with the Honeywell Lyric Controller with great success! We easily enrolled the device to the system, and we intentionally released a safe, but other-dimensional, spirit into our headquarters. We made sure to do this at night to protect the majority of our technicians and staff members. One brave soul working the late shift was around to see the SiXTH Sensor in action. Needless to say, our expectations were more than met. The Alarm Grid SiXTH Sensor will be coming soon, sometime within your existence. We will make sure to keep you posted about any news related to the SiXTH Sensor as it becomes available. Thanks for being an Alarm Grid customer, and we hope that you have a happy April! Hi DIYers! We are taking a look at two very interesting products today. 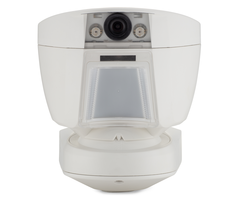 The DSC PG9934P and the DSC PG9944 are the ideal PowerG Image Sensors for use with the Qolsys IQ Panel 2 Plus Alarm System. They can both send quick and convenient images to Alarm.com upon activation for remote viewing. When the original Qolsys IQ Panel 2 System was released, it required a Qolsys IQ CARD-IS to communicate with Qolsys Image Sensors. This is still the recommended image sensor option for those with a standardIQ Panel 2. However, the IQ CARD-IS actually uses the same antenna that is used by the PowerG daughtercard for the IQ Panel 2 Plus. As a result, it is not feasible to use both Qolsys Image Sensors and PowerG Wireless Sensors with an IQ Panel 2 System. But with the DSC PG9934P and PG9944 PowerG Image Sensors, there now exist viable options for IQ Panel 2 Plus owners. Each device can auto-enroll with a Qolsys IQ Panel 2 Plus System much like any other PowerG Sensor. Remember, there is a special trick to auto-enroll PowerG Sensors with an IQ Panel 2 Plus. Knowing this technique can save you some frustration when you go to enroll the sensors! After putting the panel into its wireless enrollment mode, press and hold the learn button on the PowerG Sensor. An LED light will appear after a brief moment, but you should not stop holding the button. Keep it held down, and the light will disappear. Then it will reappear after a brief moment. At that point, you should release the button to auto-enroll. As image sensors, you can add up to five of these devices on a single IQ Panel 2 Plus System. This can be any combination of up to five total PG9934P and PG9944 sensors. 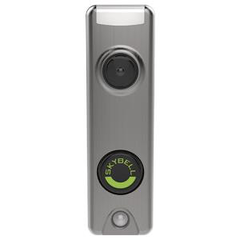 Both motion sensors function like any standard PIR motion detecting sensor by looking for changes in infrared (IR) energy that occur with movement. But as image sensors, they will take pictures using their built-in cameras. These devices can also be configured to send images upon a panel disarm or during alarm events. Only one image will be sent out at a time with the PowerG Image Sensors. Any resulting image is first sent to the IQ Panel 2 Plus, and the system forwards the image to Alarm.com. From there, Alarm.com will pass the image to anyone included in the notifications group. The image can be sent through text and email. You just have to configure that notification settings on Alarm.com. More information about setting up this feature can be found in this FAQ. In order to use the PG9934P or PG9944 with an IQ Panel 2 Plus, the system must be running firmware version 2.3.0 or higher. More information on this firmware update is available here. At this time, Alarm.com recognizes the photos produced by these sensors as "Panel Camera" images. This is the same category of images that the camera on the front of the panel uses when it takes Disarm photos. We believe that Alarm.com may change this category name during a future IQ Panel 2 firmware update. After all, we expect that users would want a different category for images produced by the panel and images produced by their image sensors. But for now that is the category to look for if you are having trouble finding the resulting images. Also keep in mind that Panel Camera Images must be enabled on Alarm.com for the feature to work. Note that you can also view the images from the panel. And below is what the resulting images look like on the Alarm.com website. Note that the image is listed as "Panel Camera", but it is actually from a PowerG Image Sensor. The major difference between the PG9934P and the PG9944 is that the PG9944 is suitable for outdoor use. It is weather-resistant and capable of surviving harsh environments. But the PG9934P is designed for indoor use only, and it will become damaged if exposed to heavy rain, wind or dust. Additionally, the motion sensor for the PG9944 is slightly more advanced than the one used on the PG9934P. But in principle, these devices function in largely the same manner. Both feature PowerG technology, which includes an extended communication range and 128-bit AES encryption for added security. They also both offer pet immunity options, with the PG9934P being suitable for small animals weighing up to 85 pounds, and the PG9944 being suitable for small animals weighing up to 40 pounds. Keep in mind that mounting location is very important for ensuring proper pet-immunity. If you would like to learn more about the PG9934P or PG9944, please reach out to us! The best way to contact us is to send an email to support@alarmgrid.com. Our team will review the email and get back to you as soon as possible. You may also call us at (888) 818-7728 during our normal business hours of 9am to 8pm EST M-F. We look forward to hearing from you! The Honeywell LYNX Touch L5210 and L7000 Updater Tool is Here! Hi DIYers! We are happy to announce that the Honeywell LYNX Touch Updater Tool is now available for purchase on our website. This easy-to-use module allows users to conveniently update the firmware for any Honeywell L5210 or L7000 and get it running on the latest software version. As you may recall, LTE Communicators for the L5210 and L7000 were released last year. There is the LTE-L57A for the AT&T LTE Network and the LTE-57V for the Verizon LTE Network. But these systems must be running Firmware Version 9 or higher to support these modules. Any newly manufactured L5210 or L7000 will already be running a high enough firmware version. However, older L5210 and L7000 Systems may require a firmware update. It used to be possible to push down an over-the-air (OTA) firmware update to an L5210 or L7000. However, this is no longer the case. All firmware updates for these two systems must be applied using the Honeywell LYNX Touch Updater Tool, officially known as the Honeywell LYNXTOUCH-MSD. This tool allows users to update the firmware for their L5210 or L7000 System at their own leisure. It will also come in handy if Resideo decides to release any future firmware updates for these systems at some point. Alarm Grid has already released an FAQ to help you use this new device to upgrade your L5210 or L7000 System. We also invite you to check out the Installation Guide for the module for even more information. Remember, you will want to get your LYNX Touch System connected with an LTE network sooner rather than later. The 3G sunset is rapidly approaching, and LTE connectivity will allow you to greatly extend your system's lifespan! 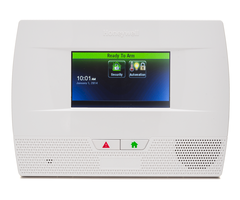 If you are an Alarm Grid monitored customer with any questions about the Honeywell LYNXTOUCH-MSD Updater Tool, or if you would like to know why upgrading to LTE is important, we encourage you to reach out to us. You may email us at support@alarmgrid.com or call us at (888) 818-7728 during our normal business hours of 9am to 8pm EST M-F. We look forward to hearing from you and answering any questions you might have! Hi DIYers! Today, we're taking a look at the 2GIG RPTR1-345. This is a wireless repeater that takes the signal sent out from 2GIG 345 MHz Sensors and repeats them out a second time. This will effectively double their range. The device also works with the Honeywell 5800 Series Sensors. Wireless sensors work by sending radio frequency signals to an alarm control panel. However, these signals cannot travel an infinite distance. If a user is experiencing range issues, then they might add a wireless repeater to overcome the problem. A wireless repeater will take the signal sent out from the sensor and send it out a second time. By doing this, the sensor's range will be doubled. In order for a wireless repeater to work, it must recognize the signal transmission that the sensor is putting out. The 2GIG RPTR1-345 effectively works the same as the wireless receiver housed inside the 2GIG GC2 and 2GIG GC3 Systems. The panel's receiver also accepts signals from Honeywell 5800 Sensors, and the 2GIG RPTR1-345 will also effectively repeat these signals. This makes it perfect for anyone with legacy Honeywell/2GIG Sensors who wants to increase wireless signal range. Most 2GIG 345 MHz Sensors have a wireless range of 350 feet in open air. However, this range can be reduced due to large metal objects and other obstacles. Mounting a sensor on a metal door or structure could also interfere with the range. Also keep in mind that some recessed sensors like 2GIG DW20R might have a shorter range than other 2GIG Sensors. But adding a 2GIG RPTR1-345 may be able to help you overcome the problem. If the signal from a 2GIG 345 MHz Sensor travels 350 feet to the repeater, the repeater will take that same signal and send it out an additional 350 feet. This will give the sensor a maximum range of 700 nominal feet. This can be the perfect solution for anyone suffering from range issues. The repeater will even work with the Qolsys IQ Panel 2 Plus with Legacy 345 MHz Daughtercard, as it can repeat the signal for any legacy 345 MHz sensors used with the system. The 2GIG RPTR1-345 is a plug-and-play device, meaning that it will start repeating signals as soon as it is plugged into a wall outlet. You don't need to program it to the panel for it to work. However, you can still program it to a wireless zone for supervision purposes. This is completely optional, but it can be smart if you have several wireless zones available. Please note that while a plug-in transformer is included, no wiring is provided. You can use a Honeywell LT-Cable to making wiring as easy as possible. DSC PG9920 - for PowerG 915 MHz Sensors. DSC WS4920 - for DSC 433 MHz Sensors. Honeywell 5800RP - for Honeywell 5800 Series Sensors only. Interlogix-80-922-1 - for Qolsys and Interlogix 319.5 MHz Sensors. Please note that there is currently no repeater available for Honeywell SiX Series Sensors. We hope that will change in the near future, as there are many user who would like to increase the range of their SiX Devices. We will let you know if such a module ever emerges. You can extend the signal range of your 2GIG Sensors with the 2GIG RPTR1-345 wireless repeater. Get yours today! If you're like many system owners, you're looking for a way to add a new noisemaker to your security setup. Maybe you need a louder sounder or you want audible alarms to occur in a second location. In any case, a wireless siren may provide the perfect solution, especially for DIY users. External alarm system sirens aren't just for users with hardwired alarm control panels. These devices make a great addition to almost any setup. Adding an external sounder is now easier than ever before thanks to the rise of wireless sirens. Unlike their hardwired predecessors, wireless sirens do not need a relay module or a complicated power supply. Most can receive power through regular batteries and stay operational for years on end. Programming is generally very easy even for novice users. And we're not talking about a conventional hardwired siren that is operated using a wireless relay like a Honeywell 5800RL We're talking about true wireless sirens that communicate directly with the security panel. There remains a common misconception that hardwired sirens are significantly louder than their wireless counterparts. While there are still industrial and commercial locations that need hardwired sounders, the reality is that there are some extremely loud wireless sirens available for almost any alarm system. Nearly every home can get the results they need using a wireless sounder. And if you're a DIY user installing your own home security system, there's practically no reason to even consider using a hardwired device when you can get great results using a wireless sounder. At the end of the day, there are still louder wired siren options than wireless sirens. But the difference is not as big as you might expect. We have encountered wired sirens that produce sounds of up to 120-125 dB. Meanwhile, the most powerful wireless sirens tend to top out at the 105-110 dB rang. But there are almost no residential applications that need the power of a hardwired siren! A 105 dB wireless siren will still alert everyone in the building to an alarm event. Keep in mind that 105 dB is about as loud as a powerful table saw. You will certainly hear it! Once you decide that a wireless siren is right for you, the question becomes which one to get. It can be difficult to decide with all the great options available. But we're here to break down the options and point you in the right direction. One of the easiest devices to recommend is the Qolsys IQ Siren. This is a Z-Wave siren that operates at 105 dB. Since it communicates as a Z-Wave device, it can successfully pair with almost any alarm system with a functional Z-Wave controller. This makes it one of the most versatile and easy to use wireless sirens available. All you have to do is enroll it with your system and keep it plugged into a wall outlet. A very similar wireless siren is the Linear WA105DBZ-1. This is a 105 dB Z-Wave siren manufactured by Linear, a company well-known for its Z-Wave offerings. This device also plugs into a wall outlet using an included transformer, and it has a backup battery for situations when the power is out. 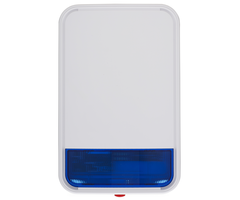 A white LED strobe light with red plastic cover provides visual indication of any alarms that occur. Just like the Qolsys option, the Linear WA105DBZ-1 can pair successfully with virtually any alarm system that has a functional Z-Wave controller. If you're looking for a louder siren, then you might consider the DSC PG9911B. This siren communicates using PowerG RF signal, making it compatible with the Qolsys IQ Panel 2 Plus Systems and the DSC PowerSeries Neo Panels. Unfortunately, PowerG is not as widespread as Z-Wave, so there aren't as many panels that can use the PG9911B. But the upside to this device is that it offers an incredibly loud sound rating of 110 dB. PowerG sensors also boast a highly impressive signal range, making this siren perfect for spots like detached garages or barns located across the property. 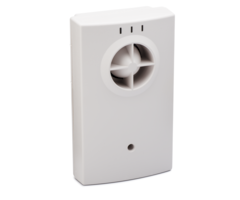 The PG9911B is also one of the few wireless outdoor sirens available, which only adds to its excellent versatility! Not every user will need an external siren in the 105-110 dB range. Some users just want a second sounder to install in the second area of the property. Honeywell offers a couple of wireless sirens that fit this bill. These are the Honeywell 5800WAVE and the Honeywell SiXSIREN. Both devices operate at 85 dB, which is about as loud as the integrated sounder inside most wireless alarm panels. They are great for users with larger properties who need sounders in multiple areas. The 5800WAVE will work with LYNX Touch Systems, as well as VISTA Systems that have an added wireless transceiver. Meanwhile, the SiXSIREN works exclusively with the Lyric Controller. DSC also offers a similar siren, the DSC WT4901, which works with their 433 MHz systems. If you're an Alarm Grid monitored customer looking for a wireless siren, our team is here to help. We invite you to email us at support@alarmgrid.com with any questions you might have. We also offer phone support for monitored customers at (888) 818-7728 during our regular business hours of 9am to 8pm EST M-F. We look forward to assisting you and helping you find the perfect wireless alarm siren for your needs!